Xiah Junsu, Hero Jaejoong and Micky Yoochun released their new min-album ‘The…’. 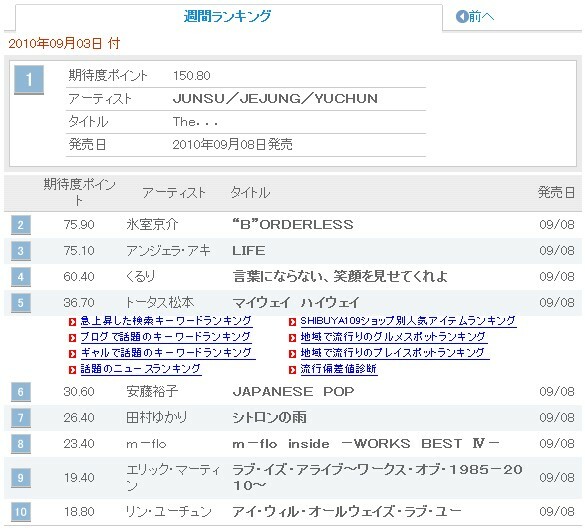 Despite being the first day of its release, the album has already secured the top spot on Japan’s Oricon Daily album charts, selling over 70,000 copies. There are 8 songs in total (including instrumental versions), 4 of which were performed for the first time in Osaka and Tokyo during their Dome concerts in June. The other day, I successfully had some interviews with Korean TV stations MBC and SBS. The content of the interviews are, “Why are Korean girl groups so popular in Japan?” This spring, 4minute debuted in Korea with a great standing; KARA debuted with “Mister”, becoming the first foreign girl group to enter Oricon TOP 5 in the last 30 years; SNSD took the 4th spot on the DVD ranking – with all the first achievements that Korean girl groups already made, it’s undeniable that the force from K-pop girl groups are very powerful. Moreover, the other day, their popularity was again shown by the amount of 22,000 audience members who attended the 3-session showcase of SNSD at Ariake Colosseum. Korean media also pays a lot of attention on this topic. What on Earth is the secret of this popularity? I asked this NHK producer Ishihara PD’s opinion on this topic to write the Korean Girl Group Sepcial Issue on Oricon in June. Ishihara PD is a person who is greatly acknowledged by the industry, he is an expert of K-pop, idols, anime, voice actors/actresses and even Visual Kei (Japanese visual rock). That’s why on the programs that he produced (MUSIC JAPAN, etc. ), he always shows what is currently happening in the music scene and satisfy the fans as well as the viewers. Ishihara PD predicted before that K-pop girl groups would have a big break in Japan. The other day, I visited the nearby Shibuya HMV shop that is already closed now, and from seeing how great sales of K-pop products, I am sure that his prediction has become true. Reading every single piece of information and checking the trend in CD shops now, seeing how the K-pop corner has been expanded, I have come to understand a lot about the music scene now. Of course, my understanding and knowledge are still nothing compared to Ishihara PD. That’s why I don’t think my writing would be completely persuasive. However, from going to see SNSD and KARA’s events and witnessing their popularity, I was shocked and asked myself, “Why is this popularity! ?” It’s amazing how the groups targeted on young female fans knowing that they would sell well, because from watching, 80%-90% of their fans are young females. People would think it’s a relief that the female fans are supportive towards girl groups like SNSD and KARA; but in contrast, the female fans must be drawn into them because they are good-looking and cute with polished dances and catchy songs. 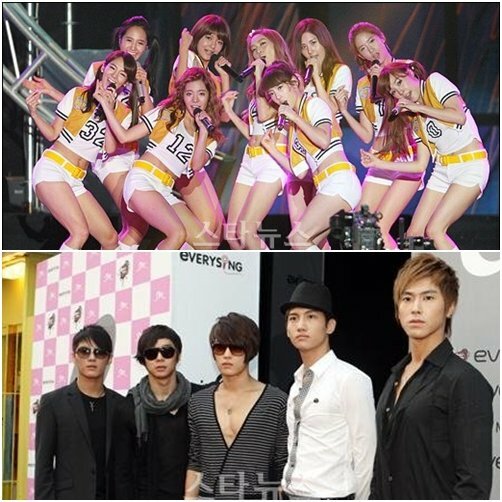 Moreover, would we consider the groups’ fashion sense and makeup style another secret of attracting female fans? Japan is already accepting Korean dramas and music. However, among all the factors, one person who is undeniably contributed a lot to the development and maturity of K-pop market in Japan is no one but Tohoshinki. Besides them, there are also a lot more male groups, but Tohoshinki is just extraordinary. Unfortunately right now, their group’s activities have been on hold, and each member is creating each own standing with individual activities. 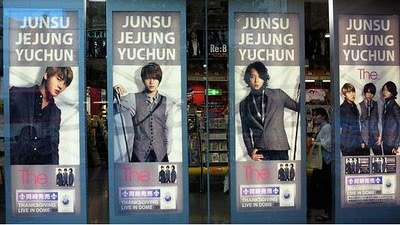 Of course each member is also greatly popular, but many fans love the 5 of them as Tohoshinki together. Their fans are probably suffering right now and that has caused a big loss in their hearts. Since the fans are mostly females in their 10s-20s, is that why they are paying attention to girl groups now? It’s just my own thinking but…. If not, would the girl groups be able to sell 30,000 CDs and DVDs and attract 20,000 people to their events by themselves? Of course it’s just my own opinion……. From now on, there will be more K-pop girl groups to debut in Japan, but just like Ishihara PD has wondered – How much Japanese would they be able to speak? Would they come out with good songs in Japanese? Would the groups that already established themselves with heavy music and powerful dance continue to sell with their concept like that? There are a lot of approaches to this topic, but putting them aside and coming back to the Japanese music scene, what would Japanese artists do in order to compete against the high-leveled Korean girl groups? But wouldn’t it be fine not to compete against them!? No, with the rate that the CD market is growing, there’s perhaps no choice but to have the artists compete for fans. Moreover, besides girl groups, popular Korean pretty-boy groups are also expressing their interests of debuting in Japan, and K-pop will make their way in to influence the Japanese music market. Japan’s renowned music chart Oricon is garnering attention for stating that TVXQ is the reason why Korean girl groups could attain popularity in Japan. On the 2nd, their column ‘The Eyes of the Editor-in-Chief’ introduced the recent Japanese activities of Korean girl groups such as Kara, 4Minute and Girls’ Generation and pointed out the majority of their Japanese fans are women in their teens and twenties.